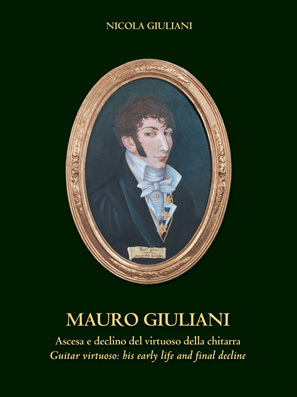 Any contribution that sheds new light onto the biography of Mauro Giuliani is always greeted with great interest. Nicola Giuliani dug through libraries and archives in search of new data and information on his famous forebear, for the first time tracing a family tree. What guitarist in Italy's great musical centres has never played Giuliani's Studies or his Variations on a theme by Handel? They have become classics of guitar literature. Mauro Giuliani went to Vienna, where he attracted the attention of audiences and musicians to an instrument that was not part of the illustrious Austro-German musical tradition, but that could very well take its place in the consolidated chamber-music scenario. This is shown by the concerts he held with the collaboration and participation of top-level musicians, such as Maiseder and Moscheles. He also earned the esteem of musicians like Beethoven, Spohr and Kummel. On his return home, fresh from his successes abroad and the numerous publications to his name, including his guitar Method, Giuliani quickly regained the attention of audiences and critics, also earning the esteem and friendship of Paganini and Rossini. He dedicated to the latter the six Rossiniane, a series of books of variations and paraphrases based on Rossini's opera themes. Nicola Giuliani takes us clearly and convincingly through the stages of a career that was intense not only in terms of concert playing but also composing. A career that was interrupted by his death, at the early age of forty-seven. Q: what year was this published?